Home / Best Shoes for Nurses, Carers and People on Their Feet? So What’s the Best Shoes for Nurses, Carers or Anyone Else That’s On Their Feet A Lot For Work? Choosing the best shoes for nurses, carers or anyone that works on their feet can be challenge. There is a whole lot of choice when you walk into a shoe store. Then there is all the OH&S requirements too. Making the wrong choice can really make your feet sore. So what do you look for? I have spent a good part of my podiatry career working in aged care facilities. I have also worked as a carer and one of the biggest things I’ve seen is the amount of foot issues that can arise from simply spending too much time on your feet. You see the role of caring for others often means spending hours on our feet. So what features do you look for when choosing the best shoes for nurses, carers and people who work on their feet? An excellent shoe is light weight, supportive, lace up (preferable), and has good cushioning. Also the rigours of caring means the possibility the shoes could get wet or soiled. So they need to have a non-slip sole and made of materials that will keep the wearer safe, dry and clean. You don’t have to be a nurse or carer to benefit from these features. Anyone on their feet a lot such as retail workers, teachers even busy mums and dads and grandparents can benefit. What about the brand of shoe? Shoe brands change their designs and features all the time. So what’s traditionally been a good shoe one season become an ok or even sub-standard shoe the next. So, the shoes that have traditionally been the “go to” shoes for nurses are not necessarily the best ones now. This is why buying shoes based on features and getting fitted by a good retailer is so important. So what are my current Top 3 best shoes for nurses, carers and people who work on their feet? #1. Xelero, this has excellent strength and support. Cushioning and durability and a removable innersole as well. This is especially good for people with foot problems. And can really help flat feet (pronators), and many biomechanical and structural foot and leg issues. #2. Ascent workwear range. 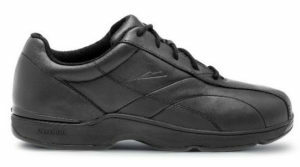 They are full leather have a removable innersole, provide great cushioning and durability, work in well with most uniforms and look more formal as well. #3. 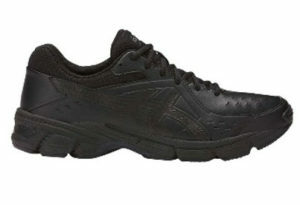 Asics Gel 195 in the black leather especially good for mild pronators. You can replace it’s removable innersole with an orthotic or use the current innersole and adjust it if more support is needed. 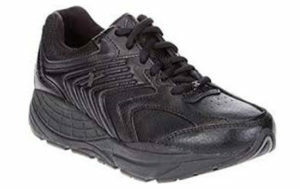 The New Balance 624 is also a good alternative for those people who don’t require additional support. Matching the right shoe to your foot type is really important as it’s not a one size fits all. Also if you have foot issues addressing those foot problems is just as important as wearing a great shoe. This ensures you have excellent feet to go in your excellent shoes. This allows you to walk all those miles caring for others with minimum stress and strain on your feet for the long term. So if you have foot problems get them checked out by a foot and leg specialist. Click Here if you would like some additional information to help you choose the right shoes. Michael Sarunic is a progressive podiatrist who has honed his manual therapy skills over a number of years. He believes in finding out the why (the cause) of peoples foot and leg aches and pains and developing tailored solutions to put a spring back in his clients feet fast.